(Lomé, July 9, 2018): ECOWAS Ministers in charge of peace, mediation, security and fiscal matters, have reviewed key measures to address the security architecture of the sub-region and institutional reforms of the regional body. The Ministers attended the 40th Mediation and Security Council (MSC) and the 80th Council of Ministers meetings from July 7 to 8 2018 in Lomé, Togo, a dispatch from the Liberian Embassy in Abuja says. 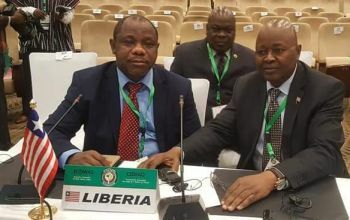 Liberia’s Ministers of Foreign Affairs, Gbehzohngar Findley and Minister of Defense, Daniel Ziankahn, attended the MSC, while the Minister of Finance and Development Planning, Samuel Tweah and Liberia’s Permanent Representative to ECOWAS, Al-Hassan Conteh, participated in the Council of Ministers’ meeting, the dispatch adds. Other Members of the Liberian Delegation were Mr. Ben Roberts, Head of the ECOWAS National Office of Liberia, and Mr. Alieu Swaray, ECOWAS Focal Point at the Ministry of Foreign Affairs of Liberia. 1. To address violent extremism in the region, focus should be placed on the long-term development response to address, inter-alia, the prevalence of acute poverty, political and economic marginalization, corruption, and bad governance. 2. Reiterate the imperative that regional cooperation amongst Member States remains the only practical alternative to guarantee peace, regional integration and development, knowing that insecurity in any part of the region is an obstacle to peace and development for the rest of the region. 3. Enhance the existing programs and initiatives to foster peaceful coexistence between herders and farmers throughout the region. 4. Take appropriate measures aimed at addressing the underlying causes of herder-farmer conflicts, including land and water issues, rural land management and climate change. 5. Work out the necessary modalities to accelerate the implementation of the ECOWAS Strategic Action Plan for the Development and Transformation of Livestock Sector in the ECOWAS Region 2011 – 2020, against the backdrop of developing a broad National Livestock Policy consistent with the ECOWAS plan. 6. Enforce ECOWAS decisions on transhumance particularly with regards to issuance of Transhumance Certificate, Animal Diseases control mechanisms, sharing of information and pastoralists and herd movements along designated corridors. For their part, the Council of Ministers, chaired by the Minister of Foreign Affairs of Togo, Mr. Robert Dussey, who also chaired the MSC, reviewed the financial and administrative status of all ECOWAS institutions and urged the Member States to make timely payments of their Community levy to implement the ECOWAS strategic plan on economic development and regional integration. According to the dispatch, at the end of the meeting, they set up an Adhoc Committee comprising of Nigeria (Chair), Togo (Secretary), Cape Verde, and Liberia, to work with the ECOWAS Commission in accelerating reform, budgetary matters, and the modalities expanding statutory posts to the ECOWAS Member States. The new President of the ECOWAS Commission, Mr. Jean-Claude Kassi Brou, who co-chaired the meetings, will be inaugurated at the Ordinary Summit of ECOWAS Heads of State and Government on July 31, in Lomé, Togo. Meanwhile, the new Vice President of the ECOWAS Commission, Madam Finda E. N. Koroma form Sierra Leone, and the following Commissioners were sworn in by the President of the Community Court of Justice: Madam Halima Ahmed, Finance (Nigeria), Mr. Tei Konzi, Trade, Customs and Free Movement (Togo), Mr. Vafolay Mbandoe Tulay, General Administration & Conference (Liberia), Mr. Mamadou Traore, Industry and Private Sector (Mali), Mr. Sediko Douka, Energy and Mines (Niger); Prof. Jeremias Dias Furtado, Human Resources (Cape Verde), Mr. Pathe Gueye, Infrastructure (Senegal), Mr. Sekou Sangare, Agriculture, Environment and Water Resources (Guinea), Dr. Kofi Konadu Apraku, Macroeconomic Policy & Economic Research (Ghana), Dr. Zouli Bonkoungou, Telecommunications and Information Technology (Burkina Faso), Dr. Siga Fatima Jagne, Social Affairs and Gender (The Gambia), Prof. Leopoldo Amado, Education, Science, and Culture (Guinea Bissau), General Francis Awagbe Behanzin, Political Affairs Peace and Security (Benin). The following Heads of three ECOWAS institutions were also installed: Prof. Stanley Okolo, Director General, West African Health Organization (Nigeria), Mr. Kimelabalou Aba, Director General of the Inter-Governmental Action Group Against Money Laundering and Terrorism Financing in West Africa (GIABA), (Togo), and Dr. Alfred Mahamadu Braimah, Auditor General of ECOWAS Institutions, the dispatch concludes.